Angie Sanchez-Vijil runs the anchor leg for the winning 4 X 800 relay team for Warsaw Thursday night at Elkhart Memorial. The Tigers picked up two more NLC wins. ELKHART – The Warsaw girls track program continues to operate like a fine-tuned machine. There is nothing that can seem to slow down the winning ways of the perennial power. The latest edition of the Lady Tigers is no different. Warsaw showcased its talented and deep roster all the way across the board once again Thursday night to continue its dominance in the Northern Lakes Conference. The Tigers claimed 12 first-place finishes on a windy and chilly night to defeat both Concord and host Elkhart Memorial handily in an NLC triangular. Emma Bohnenkamper was a double winner on the track as Warsaw topped Concord 91-41 and bested Memorial 108-24 in league competition. Warsaw improves to 4-0 in conference action this Spring and runs its impressive NLC winning streak to 64 in a row. The Tigers are aiming for a 13th straight overall NLC championship in 2018. First-year Warsaw coach Megan Davis, herself a 2008 WCHS graduate, knows she has something special. Mia Beckham takes off in the 1,600. Warsaw, which had opened its outdoor season with dominating NLC wins over Northridge and Goshen on April 10, did not miss a beat Thursday night. The Tigers got off an running from the start as their 4 X 800 relay team dominated the first event on the track. The quartet of Remi Beckham, Taylor Gunter, Ashlynn Hepler and Angie Sanchez-Vijil set the tone with a dominating first-place finish in a time of 10:46.00. Bohnenkamper continued her strong senior season as she took top honors in a pair of events. The three-sport athlete won the 800 in a top time of 2:29.30 and also claimed first in the 1,600 in 5:22.19. 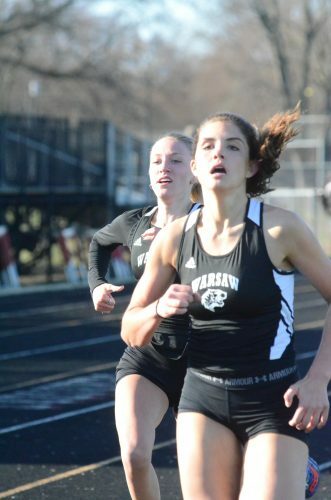 Warsaw also got wins on the track from standouts Makayla Clampitt in the 100 (12.57), Maygan Bellamy in the 400 (1:03.25) and Mia Beckham in the 3,200 (12:19.27). The Tigers won all three relay events on the evening. The team of Shunterra Davis, Kendra Love, Abbi Curtis and Clampitt won the 4 X 100 in 52.89. The 4 X 400 team of Bellamy, Remi Beckham, Lex Desernberg and Sanchez-Vijil also was victorious in 4:21.45. “I saw our girls, across the board, come out and perform very well tonight,” commented Davis, who was an assistant coach last year. “I saw them put together one of our top performances as a unit. Overall as a group tonight we did very well collectively. Emma Bohnenkamper won both the 800 and 1,600 for the Tigers. Warsaw also put up winning efforts in the field events. Standout Lexie Day cleared 5-2 to win the high jump event. Caitlin Kehler won the pole vault by topping 10-0. Davis sailed 15-6 to claim first in the long jump and Passon Gardner won the shot put with a throw of 36-6.50. The Tigers showcased their depth in a big way too. Warsaw placed 1,2,3,4 in the 800, 1,2,3 in the high jump and took the top two spots in the 400, 1,600, pole vault, long jump and shot put. That kind of depth will come in handy later in the season as the team shoots for its 12th sectional title in a row and tries to win its seven consecutive regional crown. “We’re looking at the big picture down the road and I think things are starting to set up well for us,” said Davis, who was a throw in the WCHS program and then went on to compete for St. Joseph’s College. “We have quite the caliber of depth. Warsaw returns to action Saturday in the West Lafayette Relays. The team will wrap up NLC regular season action Tuesday night by hosting Wawasee and NorthWood. The NLC Meet is scheduled for May 8 at Goshen.